I like to look at my annual lists as goals, as opposed to resolutions. It helps when I don't achieve them. For breaking resolutions has a different connotation than falling short of a goal. This is especially true when the achievements I seek rely on some outside forces beyond my control. 1) Organize my information. For the past 9 months, as I've joyfully discovered all the avenues of exploration available to me, mostly online, I have done a lot of research, and a lot of research lies ahead, but before I continue I need to develop a better system of organizing the information. 2) Get out of my house and into my car. There are several places nearby I wish to visit. This includes: The Missouri Historical Society, Missouri Archives in Jefferson City, local archives in St. Louis County, MO and St. Clair County, IL, and a handful of cemeteries. The only trip that will really require some gas is Jefferson City. That's a 4-5 hour round trip. But I occasionally have to drive down there for work, and when I do, it's usually only for a 1-2 hour morning conference, so I can spend the afternoon in the Missouri Archives. I might also end up traveling to Springfield, IL, but I'll need to have a better idea of what I want to find in their archives before I make that trip. 3) Learn to navigate the Polish Vital Records system. It doesn't sound too difficult, with the language barrier being the biggest hurdle. But this guide, and this one should help me write the letter, and this guide should help me read their response. The certificates give a snapshot of where the Newmark family was on each date, and the earlier certificates show my great-great-grandfather’s progression from Journeyman Tailor to Master Tailor. I learned the dates of birth for the youngest three of my great-grandfather’s siblings – the ones not born in Poland. There was a sibling, who went by the name Max, who could have been born in either location. The given name, Morris, on the fourth certificate was pretty close, so I had to order it to see the parents’ names. I now have a certificate for a likely non-relative, but if it had turned out to be Max, it would have been worth it. The most important thing I learned from the birth certificates was my great-great-grandmother’s maiden name, or at least I now have a fair sense of how it was likely pronounced, even if I don’t know its proper spelling. Since we had her in our records as Rose Garten, with no supporting documents, and now she is Rose Cantkert, with some supporting documentation, I consider that major progress. I also like what I learned about London’s Great Synagogue as a result of the research I did from the marriage certificate. The couple had four children in London between 1902 and 1909, but neither parents nor children are direct ancestors, so I am going to see if I can convince some of my cousins to order the certificates. The will was for a William Denyer of Hampshire - d. 1732. I have traced my ancestry back to a William Denyer of Hampshire born in 1770. How the two connect, if the two connect is unknown. Thanks to Missouri scanning in death certificates, I downloaded about a dozen for free, learning dates, addresses, burial locations, and more. So far this is the only certificate I had to get up off my posterior to get. (Without counting the activity it takes to mail a letter.) I could have paid the county clerk to do the research, but walking into the courthouse and just paying the cost of the copy made more sense. The one inconvenience is that the office hours are 8-5 Monday to Friday. So I actually took a vacation day to do this. I had hoped to find two marriage certificates, and several birth certificates. However, I learned the birth records are all in Jefferson City, and one set of paternal great-grandparents, Barney Newmark and Bertha Cruvant, were married elsewhere. Probably in St. Louis County or St. Clair, IL. (St. Louis City is a separate county from the neighboring St. Louis County, and East St. Louis, IL, is in St. Clair County, which can confuse some researchers.) I retrieved the marriage certificate of my great-grandparents Herman Feinstein and Annie Blatt. The most interesting thing perhaps learned was the name of the Rabbi who married them, and thus possibly the congregation to which at least one of them belonged. Unfortunately, the congregation disbanded in the 1940s, and its records have been lost. 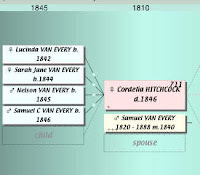 I learned the date of marriage (May 14, 1854) for great-great grandparents Ebenezer Denyer and Sarah Ann Hartley. (The date of marriage is actually online at the Gonzales County website, so I didn’t really learn it from the certificate, but I have the documentation to back it up, and it was only $1.) It’s not a great photocopy. I’d be willing to pay more for a better reproduction, but it’s not exactly common that county records go that far back, so that I have anything is a miracle. I learned a little about my great-grandfather, Herman Feinstein. However, I was hoping to find out where he was born. Both of his parents had died by 1936 when Social Security began, and all he knew was that he was born in Russia. Total: $130 spent over a nine-month period. I feel it is worth the information I learned. I suspect the number of documents will ultimately go down, as there is a finite number of individuals I am currently interested in documenting, but the cost may go up if I start looking for the Polish and Russian records. FootnoteMaven has challenged geneaBloggers to post their favorite carols. I tend to prefer the seasonal ones over the religious ones, since I don't celebrate the religious side of the holiday. As a child, my favorite was "Please Bring Some Snow (for Johnny)". As I grew up, I realized the song wasn't really written for me. One of my current favorites is by Country artist, Skip Ewing. "My Name is Christmas Carol". It always brings tears to my eyes. so I asked her what's your name and what can Santa do for you? She said my name is Christmas Carol, I was born on Christmas Day. I don't know who my daddy is and mommy's gone away. All I want for Christmas is someone to take me home! Does anybody want a Christmas Carol of their own? Well all that I could say was Santa would do the best he could. Then I sat her down and told her now remember to be to be good. She said "I will" then walked away, turned to wave good-bye. And I'm glad she wasn't close enough to see Ole Santa cry! Early Christmas morning I got up and dialed the phone. I made a few arrangements at the County Children's home. They told me it would be alright to pick her up today. My name is Christmas Carol, I was born on Christmas Day. The 38th Carnival of Genealogy has been posted. Several people were better able to remember what happened on December 31, 1999 or December 31, 2000 than I was. Susan Kitchens, of Family Oral History using Digital Tools, has been blogging since then. I started blogging in 2002, but reading her entry I recalled that I purchased my own domain name in early 2000. Alas, it was in February. So I still don't know what I was doing a month earlier. The 39th Carnival is our New Year's Resolutions with respect to genealogy research. As the year winds to a close in the next couple weeks it's a good time to review the progress made in our genealogy research and to make a plan for next year. So what did you accomplish last year and what road blocks did you encounter? What are your research goals for next year and how do you resolve to attain them? While I am in the Caribbean from this Friday until December 30th, I will give this some thought, and I'll write those thoughts up when I return. The tour-guide confirmed the information. Here’s a brief biography of Fido Lincoln, with three photographs. Around 1855 Abraham Lincoln's beloved Fido was born. He was a mutt so to speak but as far as the Lincolns were concerned, Fido was royalty. He was often seen with his master around Springfield carrying a newspaper in his mouth. He was a brownish dog with more or less yellow in his coat, resembling perhaps a shepherd. also mentioned that he hadn’t gone to DC with the Lincolns, the newly elected President not certain the beloved dog would survive the trip. Fido was left with neighbor boys, John and Frank Roll, with explicit instructions that he be pampered in the style to which he had been accustomed. However, the museum's blurb didn't mention that Fido Lincoln Roll’s death mirrored that of his former master. One year later, Fido was also "assassinated" or killed by a man, who, in a drunken rage, stabbed the dog to death. Fido had playfully put his paws up on the man who was sitting on the street curb. Fido had strayed from his home with the Rolls, and like his master, was assassinated. Extremely sad, but Fido did live ten years, in a manner most 19th century canines could only dream about. 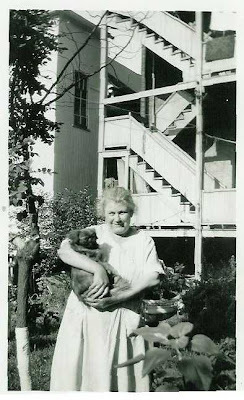 A month ago I was looking at some photos in my late grandfather’s collection, and noticed a photograph of my great-grandmother holding a pup. I was told by my mother the dog’s name was Choo-Choo. So I went to the IFamilyForTiger forums and made the suggestion. Keith Wilson, the developer behind the software, gave me a few ideas for recording pets as the software currently stood, and also said there was a potential for an AssociatedPerson entity in the future. While meant for friends, business associates, etc, it could certainly be expandable to our animal companions. I look forward to that extension, for recording animal companions, but also because I can think of a few friends and associates for whom I would write entries. However, I know other features may be ahead of it on his list. I also know he is busy working on IFamilyForLeopard which I expect to be updating to when it is released. Miriam at Ancestories, and Tim at Genealogy Reviews Online, have begun a meme asking the question - where were you for the census of your life? Summary: Anywhere from 2-5 census forms filled out with me on them over a period of 4 census. I’m batting anywhere from .500 to over 1000. Future census I hope to do better, and encourage my family to do likewise. I've been geneablogging for six months now, and it's approaching January, a natural time for reflection, so I've been asking myself where to go from here. What posts have garnered the most positive response? 1) a reader saying: "Thanks for posting this"
2) a reader saying, "I think I'm related to you…lets exchange info!" Call me selfish, but if a post generates positive reaction #2, I don't care if everyone else is bored silly by it. But considering how much I have been helped by other genea-bloggers in my research, I'd like to help/entertain others in return. I think I've seen what has generated positive reaction #1. 1) Tech-geek posts. Examples include my recent post on downloading YouTube videos, and some earlier posts on Google Groups' Usenet archives, and Google Books. I've spent 10 years doing amateur web design, and I do internet research as part of my daily job, so I have some experience, and ideas to share. I think I may go into some detail on the process I've gone through in creating a family website. 2) Reviews. My review of Ancestry's latest 'book' offering, and earlier reviews of genealogy software. There may not be much for me to review, but if I see something, I will. I like the idea of posting some family ahnentafls like I've seen others do, though unfortunately mine are relatively short. Of course, I haven't been doing research for very long. There are a handful of lines that do go back a distance, but one comes from research by a cousin who has not given me permission to share the research with the world, and I will honor my promise not to. The others come from questionably sourced material I have found on the internet, and elsewhere, but I could indicate that in the post. In addition to not publishing research done by others without their permission, I have so far refrained from posting photos, and for the most part, writing anything about living kin. The only exception I can think of are a couple posts where I mentioned I was cousins with some individuals who are public or semi-public figures, but I didn't say much that wasn't public information. I don't see that changing as I don't really want any internal family squabbles to result from my blog. I've begun a little research on my Swayze ancestors, because I think they arrived in the US earlier than any non-Native American ancestors (circa 1650). I could end up writing about what I'm discovering, but there would be no reason to write about any of their living descendents. Of course, if I turn up any black sheep, perhaps this blog could end up getting quoted in some tabloids. The Genealogy Carnival for the 6th of Tevet is to remember what we were doing at the turn of the Millennium. I’m confused. The millennium changed 768 years ago. I wasn’t alive. I have been unable to trace any of my ancestors back that far. The best I can do with one line is to take it back to 5229. I don’t expect to live to the year 6000. To do so would require some major advancement in science. OK, so I’m not really confused. I actually had to find a calendar converter online to figure out the Hebrew date for December 15th this year, and to convert 1469. I did recently post a Xmas card my grandparents exchanged, after all. I don’t recall what I was doing exactly on December 31, 1999 or December 31, 2000. Which one was the Millennium depends upon whether you are more interested in the calendar-odometer, and the ‘turning over’ of the numbers, or whether you’re counting from the ‘Year 1.’ Both years I know I was partying with friends, but we didn’t do anything particular to celebrate the Millennium. Another question I never heard discussed (though I may not have been discussing it with the right people at the time) is whether the 'New Millennium' began on Jan 1, or Jan 14. That "Second Millennium" was 13 days short of 1000 years if you observed it on January 1. Thank Pope Gregory for that. I am curious what my ancestors were doing on Dec 31, 1899. A little Google research turned up that in 1900, Samuel Clemens was in London, so it is conceivable that my Newmark ancestors crossed paths with him during the time he was there. There are some people, however, who were in a metaphysical state of existence/non-existence on December 31, 1899. Erwin Schroedinger was only 12 years old, and in Vienna, at the time. Apparently on December 30, 1899, the captain of a passenger ship called the Warrimoo noticed that they were extremely close to the international date line, and the equator, with enough time to play the ultimate practical joke on all the passengers. So at midnight, December 30, the date line was crossed at the equator, jumping instantly to Jan 1. No December 31! And since they were at the equator, there was a moment in time they were half in one hemisphere, and half in the other, half in winter, half in summer, half in the 19th century, half in the 20th century. I have no idea if this was repeated 8 years ago. (source) I also can’t find a passenger list for the Warrimoo, so I don’t know who was on the ship. Anybody can edit Wikipedia. That includes you. So when you see a mistake, you can correct it. All you need to do is hit the 'edit' link at the top of the page, and make the edit. Of course, that also means those with ill-intent can make changes too. And there is a lot of spam. However, there are enough users of Wikipedia that spam tends to last extremely short lengths of time. Tips/Advice from someone who has edited Wikipedia entries. You don't have to register. You can edit a page anonymously. (Your IP address will be recorded, so it's not really anonymously, but the IP address won't be traced unless you start posting libelious statements or something.) If all you are going to do is correct grammar and spelling mistakes, personally, I don't think registering is really important. But if you are going to add content, it's appropriate to register, so that people can identify X made this edit, and made this other edit 5 days ago. It builds a reputation. 2) You can click on your username at the top of the page (the link should be red), and create a userpage. Say who you are. You don't have to provide your real name, but can still tell people a little about yourself. Not everyone does this, but if you want people to know whether you are a 17 year old high school student, or a 50 year old professor, this is the place to do it. Once your userpage has been created, your username at the top of page will be blue. Any red link on Wikipedia means the page is empty. 3) When you add content, provide a source, or it might be deleted as unsourced content. You might be replacing unsourced content with your own unsourced content that you know is correct. However, other editors won't know this, and they might decide that sticking with the previous content is a better choice. Wikipedia is attacked often as a resource for inaccuracies. There have been studies done, however, that show it compares well to other encyclopedias. Of course, I recall being told as a college student that encyclopedias in general aren’t great reference citations. That’s because they’re secondary. Someone wrote the entry in the encyclopedia based on other sources. Go to those sources. That doesn’t mean an encyclopedia isn’t a good place to start research. And Wikipedia is no different in that regard. However, Wikipedia is a little different from the normal encyclopedia, in that it is constantly being edited, and it isn’t at first immediately clear at what stage of the editorial process a particular article is in. But there are ways to evaluate individual articles. 1) Check to see if for the particular information I write down there is a source citation. I write that citation down so I can look that up later. Citations are heavily encouraged at Wikipedia, and an article that doesn't have them usually has a warning message on it at the top stating that the article lacks citations. (e.g. unfortunately, the entry on Genealogy) Particular facts within the article can also be labeled as needing a citation. I also check the most recent edits to see if any of them impact the information I am interested in. 3) I look at the "Discussion" page to see if there have been any disputes over the content of the page. Yes, this is more work. But these added steps do help one judge whether a particular article is reliable, and it is still quicker than going to the library. And if there is a source citation, I can take that to the library, and save a lot of time I would have spent there trying to find the information. The above is edited slightly from a post I made recently to the APG-L list. I am not a professional genealogist, but I do subscribe to the list to hear the discussions of professional genealogists, and I occasionally contribute to the conversation when I think I have something of value to contribute. The subject of Wikipedia was raised, and I have had experience editing entries on the site, and I am a SysOp on a local St. Louis wiki. Part II will focus on advice for the individual who wishes to edit an article. Anyone can. Jasia at CreativeGene had a post recently on Christmas cards which reminded me of a recent discovery. I was scanning a collection of letters my maternal grandparents wrote to my great grandmother. In the box was a Xmas card my grandmother sent my grandfather in 1942, when he was in Africa. And then he sent it back to her in 1943. I took a quick glance at the inside, saw the poem by Edgar Guest, and my grandmother's signature, my grandfather's note, and almost put it back in the envelope to set aside, as the sentiments were nice, but there was only a little more than their signatures. I was happy to see she appreciated the poetry of Edgar Guest, as I do. I figured I might scan it later, but I wanted to focus on the letters. And then I took a double-take. My grandmother had cut her face from a photograph and pasted it onto the card. In my defense, I missed it at first partially because I never knew her. She passed away 18 years before I was born, and this is one of only a handful of photographs I have of her from the 1940s. I like how she personalized the card. Sixty years before the advent of Photoshop -- proving you don't need a computer to do it. The University of Florida has some potentially useful digital archives. The maps were mainly designed to help fire insurance agents determine the degree of damage to a property and show accurate information to help them determine risks and establish premiums. They showed the size (including color-coding), shape and construction of buildings (brick, adobe, frame, etc), dwellings (including hotels and churches), and other structures such as bridges, docks and barns. Along with fire stations, you could also find water facilities, sprinklers, hydrants, cisterns, and alarm boxes as well as firewalls, windows, doors, elevators and chimneys and roof types. The maps included street names, property boundaries and lot lines, and house and block numbers. Other information such as the latest census figures, prevailing winds; railroad lines and Indian reservations and topography were included. Today, the maps are an invaluable guide to inner-city history, land use, and historic preservation. The Oral History Collections comprise the digital holdings of both the Matheson Museum and the Samuel Proctor Oral History Program at the University of Florida. These are transcripts of over 1500 interviews. The only names I recognized were Dean Rusk, Gen William Westmoreland, George McGovern, Lawton Chiles, Shelby Foote, Tom Wolfe, and Sen. Eugene McCarthy. There may be a few other 'big names' I missed, but the majority aren't. The Program's major collection has more than 900 interviews with Native Americans --including Seminoles, Cherokees, and Creeks. Other holdings include such diverse subjects as African Americans in Florida, civil rights activities in St. Augustine (1964), women in Florida, pioneer settlers, a history of Florida education, the citrus industry, and the Florida Highway Patrol. The Museum’s oral history collection includes 125 interviews of Alachua County residents from all walks of life. Topics include family history and genealogy, the home front experience during the World Wars, schools and businesses, development, race relations and integration, the University of Florida, and the experience of daily life and culture in Gainesville and Alachua County over a 100- year time span. Searchable scanned issues from 214 newspapers across Florida. Issues dating as early as 1762 and as recent as 2006. November is over, and I'm done attempting to write 50,000 words in one month. Alas, I didn't complete the task. But I wrote enough to see the full path my protagonist would follow so I should be able to complete the work. There is always the obstacle, the barrier, the need for bravery. Novel: Deryni Rising, by Katherine Kurtz. First novel in a long fantasy series. Sixteen books so far. I've read the books before, though I decided to do a reread of the first to gauge the reading/maturity level. I am uncle to a 9-year old who has read approximately 42-book-equivalents in the past 11 months. I use that strange term as she has read the same 7 books six times over. Her parents are a little desperate to get her to read something different. They have no problems with the seven books, they just feel six times is a bit obsessive. Especially since she isn't responding well to their helpful suggestion to read one "different" book inbetween re-readings. I've decided the Deryni novels might be a bit more appropriate in a couple years. There's probably a little too much religion and court-politics in the books for her enjoyment right now. I'm leaning either towards Madeline L'Engle's Time Quintet (which begins with A Wrinkle in Time) and Laura Ingalls Wilder's Little House series. The latter of course being a fictionalized family history. Finding a rhyme for 'freak' was difficult, however, thanks to Creative Gene, I found We are Multicolored which allows you to create a flag from the components of flags from three different countries. Choosing three can be difficult. I'm Romanian, Dutch, Polish, Lithuanian, Russian, and American. However, of my ancestors, the Polish, Lithuanian, Russian, and Romanian ones would likely argue that yes, they came from those countries, but they left those countries because they were no longer wanted there. They share more in common with each other than they do with others from their old lands. 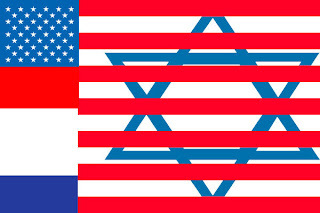 Which does bring me down to two nation's flags, and a symbol from a third. I'm not 100% thrilled with the design I made, but it is sufficient. YouTube doesn't tell you anywhere how to download a video, because doing so would be encouraging you to do it, and would get those whose copyrights are being violated even more upset. However, you only want to download the video for genealogical purposes, so it's OK.
1) Go to YouTube and copy the URL for the YouTube video. 3) The file downloaded will be called get_video. You will need to rename it 'filename.flv'. You will notice at KeepVid that in the dropdown menu next to the input box there is a long list of video sites. YouTube is one of many sites that KeepVid is able to download videos from. The Greeks had a word for it, it was "hubris." My grandfather, Sam the tailor, also had a word for it, "chutzpah." - Victor Gold, Invasion of the Party Snatchers, 2007. Due to the geographical closeness of Greece and Israel, and due to the similarity in the meanings of the words 'hubris' and 'chutzpah', one does wonder if there is any etymological connection, but I doubt it. Etymology, the genealogy of words, fascinates me as well. On my mother's side, there's even more to kvell about. I recently found on the internet several photos from a 1971 issue of a popular magazine displaying a distant kin in all sorts of interesting poses. I don't know how we're related, but she has one of my surnames, and there's a good chance we're cousins. (3rd, 4th, maybe even 7th, but cousins.) There's probably an interview with her I can read if I find a copy of the magazine. I'm sure the interview will tell me a lot about my family. I have been impressed this holiday weekend how well my family does get along. We don't really need many of the items in the Survival Kit. But maybe your family does, and even if you don't, the video is fun. I recently discovered a website called Totally Optional Prompts which prompts you for poetry on a weekly basis, every Saturday, and then the links get added on Thursday. A weekly poetry carnival of sorts. I like reading and writing poetry. This week's theme, naturally, is Thanksgiving. I'd like to share one of my favorite classics for the holiday, and one of my own. Tellin' our stories as women an' men. An' I'll put soul in my Thanksgivin' prayers. Guest's sentimental poetry has been parodied much over the years, but there are moments that are perfect for sentimentality, and Thanksgiving is one of them. I wrote the following poem several months ago -- for Passover. But it mentions Thanksgiving, and may humor those who aren't enthused about Guest's sentimentality. The contents are true, though the name of the relative has been changed. If he discovered this poem though, I think he'd find it humorous, as he has always been able to laugh at himself, and he would know I'm laughing too. He mourns the Native Americans. Harold will be at the Thanksgiving table on Thursday, and I'm looking forward to it, because he's family. I know this doesn't sound very genealogical...but it all has something to do with whether or not your ancestors were stacked. I was with the article up until the last paragraph, then I got lost. I've blogged before about my difficulty in determining great-great grandmother, Rose Newmark's, maiden name. I think I am still leaning towards Cantkert as the most likely Polish name. 2) Capture an ancestor or relative I never knew at all. Here candid means less, as I'm trying to get a picture of them in my head. Trying to detect family resemblances between them and those I do know. Every once in a while I'll come across a photograph where the background is actually more interesting than my ancestor. Take this photo of my grandfather, for example. His face is in too much shadow to really appreciate it as a photograph of him. I have a few other photographs of him from his service during WWII that are much better. However, what's going on with the Sphinx? On the back of the photo is written "The Sphinx: Chinning on some sandbags for protection from bombs." 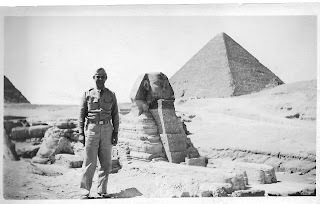 A Google search on: Sphinx sandbags - will result in some articles about how the Sphinx was protected during the war; the only image I was able to find to compare with my grandfather's, was this one. 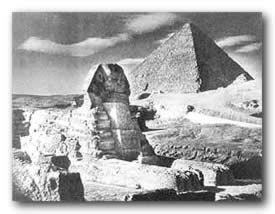 I like how my grandfather made it an action the Sphinx had chosen to do to protect itself. There's a meme going around, and I've been tagged (twice), but the last book I read was less than 161 pages, and the book I'm writing for National Novel Writing Month isn't quite there yet. Hopefully before the month ends. So I thought I would start a meme of my own - this one related to genealogy. No tagging...whether to help spread the meme it is up to you. 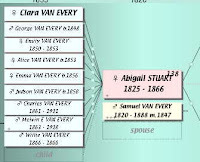 Here's a picture (from my genealogy software program) illustrating quite well, I believe, one rather productive ancestor. He needed three wives, but not at the same time. Bonus points for a snapshot of your genealogy software illustrating the feat. My Ancestry.com account expired at the beginning of the month, and I am already suffering withdrawal symptoms. One is able to search through the databases for free, and if you don't have "exact match" checked, they will provide names and locations. But, you can't view the image, or see some specifics like dates. And waiting until I get to the library isn't working well because I don't have a regular library routine. Randy posted about the amazing deal he got through NothingButSoftware when he purchased FamilyTreeMaker. I'm somewhat embarrassed to admit I remember reading Randy's post back in October. The deal now isn't quite as good as it was then...but it's still good. I ignored it a month ago --this is going to sound funny-- because I own a Mac. FamilyTreeMaker is PC only. NothingButSoftware Deal: FTM 16, a year of Ancestry, plus more software and books: $60. I can decrease that to 9 months of Ancestry, and pay only $30. I could buy the package, sign up for Ancestry, and sell someone FTM16 (Or just give it to a friend. I'd still come out ahead.) It's possible Ancestry could balk at me extending my subscription over the phone as opposed to through the software. Randy was successful, but I wouldn't be calling the day my account expired. I suspect I will have an Ancestry subscription again in the not-too-distant future. While I was interested in the list of streets and buildings that were named after individuals with my surname, Ancestry missed an opportunity when they created their new books (see review in previous entry). They should have input the surnames in this database of superfund sites. Yes, I just learned there is a Newmark Groundwater Contamination Superfund Site, near San Bernardino, CA. I am so proud, even though it's probably due to the family that refused to give my grandfather a job. Search to see if you have any hazardous waste in your family tree. It was the early-1930s, Great Depression, my grandfather and a couple friends hopped a train in St. Louis and rode it to California. Upon arriving in California, my grandfather saw a large building with the name Newmark on it. He had no idea he had relatives in California. So, naturally, he walked inside and asked for a job. And they told him to go away. They were probably nice about it, but it was the Great Depression, and there were no jobs available. Not even for potential distant cousins. No jobs were found, so the friends hopped another train, and rode back to St. Louis. My grandfather married my grandmother, had a successful career as a lawyer and a judge, and all was for the best in the best of all possible worlds (to quote Voltaire). However, when he heard about a family history book entitled, California Family Newmark, he bought a copy. So when Ancestry recently announced they were publishing their "Our Name in History" series, I knew I had to buy a copy of "The Newmark Name in History," in memory of my grandfather. I knew the books had to be created by computer, pulling data from Ancestry's databases to create charts and graphs and mixed together with stock text. But there was still a chance the charts and graphs could be interesting, as well as the stock text. Q: Is the book worth $29.95? Someone who has spent significant time researching their family history already isn't likely to learn much, or get too many leads. In their introduction, Ancestry is careful to insert two disclaimers: 1) this information is about the surname in general, and not about the reader's specific ancestors. 2) data shouldn't be confused with fact. I will illustrate both of these disclaimers in the review. However, I feel this book would be a good first book for a son or grandson of high school/college age, or an adult friend who has shown some interest in genealogy, but doesn't quite know where to start. There is a section at the back that provides tips on research, and organization, along with some sample forms to get one started. The data that is presented should whet their appetite. The Newmark Name in History is 94 pages. When I browsed through the different surnames at Amazon, the longest volumes were 98 pages, so there is some information other surnames have, that the Newmark surname doesn’t. My guess is that since Newmarks appear in the United States about 1840, the missing 4 pages cover the years prior to that. However, 4 pages seems short to do that in. It is possible there is some variance in volumes, and more material was provided on the 19th century in mine than there would be for surnames that had a presence in America in earlier times. I do have ancestors who were here during the Revolutionary War; the Vaneverys. 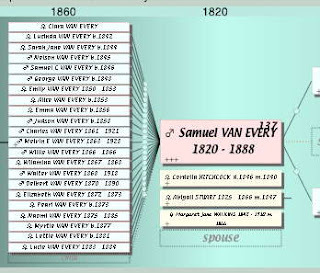 Interestingly, the Vanevery Name in History is a shorter volume than The Newmark Name. My suspicion is that several pages on 19th century immigration are missing. It’s good that there is variance; but it means I can’t give a complete review from one volume. But still, I think I can give you a good idea of what you will receive. Pages 78-85 are a section devoted to a five-step process for researching, and organizing your family tree. 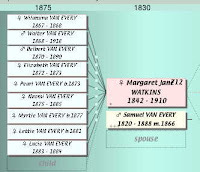 Following this is a blank sample Family Tree Chart, Family Group Sheet, and Research Log. Then there is a glossary of Family History terms, and a list of sources, including a lot of websites. This would have been the most natural section to push Ancestry, but they only include it in a list of other websites, including FamilySearch, CyndisList, FamilyHistory, Rootsweb, USGenWeb, and VitalRec. I was impressed by, and appreciated the restraint they showed in advertising their website. There is also the occasional ‘silly data’ such as the most common day of the week for a birth or a death in your family. I guess there are people who might think that’s significant. There are times when it becomes painfully obvious that a computer produced the volume instead of a human. For example, for “Places of Origin for Newmark Immigrants” the chart shows that most immigrants (38) came from Russia. So they include below the chart a generic paragraph about generic Russian immigration. “The first Russians in the United States were explorers from Siberia that settled in Alaska in 1784…The large number of Russian immigrants declined in 1952 when the Soviet government began threatening those who tried to emigrate.” However, 37 immigrants came from England, 8 came from Great Britain, and 5 came from London. If a human had created the book, there would be a paragraph on immigration from England. However, ironically, I know that a good number of Newmarks only stopped briefly in England (my family was there for 15 years), and really originated in Poland or Russia. So in actuality, while the data indicates the majority came from England, the majority really didn’t originate there. Similarly, in 1880, out of the top five occupations for Newmarks are “Keeping House” and “Keeps House”. The sixth most common occupation got pushed off the list by the duplication. In summary, I don’t think I have any new leads for research (except the long list of websites in the back pages under “Selected Sources”). I’m not disappointed. Some of the information is at least fun to have. There is a significant amount of good reading material about life in America. And the section on research and organization could be beneficial for any beginner. (Which I still am.) These books appear to be meant for the newcomer to genealogy and family history. They’re meant to ignite the spark. I don’t have a large interest in buying a copy for any of my other surnames, since I am almost certain most of the stock material will be repeated, and I don’t expect to learn anything truly essential to my research. However, I might get a copy of the Vanevery volume since they immigrated in the 17th and 18th centuries, and while I don't know for certain, there might be some good articles on that time period. There also could be more information on Canada, since that's the part of my family that were Loyalists and they fled to Canada for a couple generations after the Revolutionary War. Instructions on how to add text to, and otherwise alter Amazon images as done at top of entry. Inspired by Randy's post on genealogy related songs, here are some poems, by some well-known and not-so well-known poets. All related to genealogy and family history. We start with 8 lines from a poem I just discovered. The rest of the poem isn't genealogy related, but no one should argue these lines fit the theme. Dorothy Crump were the words. Crump? What a horrible name! Nothing but “Dolly”; and so, that was enough for a name. Chris links to a story about twins born on opposite sides of the daylight saving time switch so the first has a later birth-time than the second. Of course, this has the chance of happening every year somewhere. And since a lot of countries move their clocks about like we do, and twins aren't too uncommon, it probably happens most years. But the idea that this could possibly change the birth order reminded me of something I've thought about before. To suggest that it is the numbers in the time that matters, and sets the birth order, as opposed to what the numbers represent has a parallel in names. My name is 'John'. If I see someone spell it 'Jon' I will correct them. If someone from France tries to call me 'Jean' I'll smile, because I'm a fan of Les Miserables, but I'll correct them too. Many people are this way today in America, and probably elsewhere. We see our names as a series of letters. The series of letters is immutable. Some might argue this reduces the names back to a series of letters again, but it's a series of letters with meaning, as opposed to the random drawings of scrabble tiles. Several genea-bloggers are conspiring against me. That's how I view it at least. Here I create a separate blog for genealogy and family history, separate from my usual in(s)anity, and try to remain serious with the exception of an occasional Friday Five. And first there was Cow Hampshire's challenge back in September to have fun for a day, so I created a Hobbit Family Tree. That was OK. Didn't mind that. And now Terry (again) has issued a photo challenge to all H.O.G.S. bloggers. Well, he did offer me membership into his club, even though I had declared myself a GHOTI, and I did accept. The challenge is to post a photo of one's self - dressed up as an adult in costume - and it should be a 'defining moment'. Randy responded with a wedding photo...but I don't have that option, unfortunately. I could post a picture of myself at age 13 in suit and tie...and try to claim that the Law of Moses declared me an adult, but I know that would be stretching things. (sigh). So I've made my choice of photos. Two of them. Together, they do a good job of defining me. This was taken in 1992 or 1993. I was in my mid-20s. That should be of sufficient adult-age. You can see I am wearing a Star Trek uniform, and I am sitting in front of a phone. 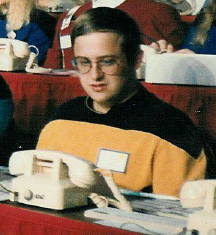 In 1992 i joined Starfleet International, the Star Trek Fan Association. I was, and am a Trekkie. The local chapter has always been very active in community service (striving to make the future like the one we see on television) We were volunteering for the Jerry Lewis Telethon. I am still a member of the chapter. I'm not sure how long I'll keep the subscription. It's definitely worth $20 to subscribe for a month. I found close to thirty obituaries of extended family members. I'm researching both direct ancestors, and all descendants of ancestors, though the more distant the cousin, the less interest I tend to have in them. For the relatives I don't know very well, obituaries are a great resource since even the most basic often list the names of children and grandchildren. And in the few cases where the individual was known in the community, you get glimpses into their life. I also found out information on closer relatives I've actually met which I didn't know previously. For example, I knew that a great uncle's first wife had multiple sclerosis, but I didn't know he was one of the co-founders of the local chapter of the National MS Society. In my entry on Google News Archive I mentioned discovering an obituary for a distant relative. I didn't purchase the whole obituary as the snippet the News Archive provided was quite ample, but GenealogyBank had the whole article which provided even more information. However, alone, the obituary collection doesn't justify an annual subscription. I copy and pasted the text from all the obituaries I could find into a Word document. When my collection of surnames increases, or after a suitable length of time to produce new entries (sounds morbid, I know), I could purchase another month. They have a collection of historical newspapers one can search. I didn't have much success in finding useful information in this search. My ancestors just didn't rate many news stories. And until I have new names to search, the historical newspapers aren't going to change much. Sure, they are supposed to be adding newspapers all the time for all their searches, so it might make sense to buy 1 month a year, but I don't feel it's a resource I need constant access to, so I'd rather save $70/yr which can be spent elsewhere. Still, I highly recommend the site, because the information I did find in one sitting was well worth a month's cost. And some may have greater luck with the historical newspaper search than I did. While we do our best to adhere to these estimates, our inventory is constantly changing based on information we receive directly from our suppliers. Occasionally, unexpected fluctuations in supply or changes in release dates for new products will add time to our original availability estimate. Since this is a "Print-on-Demand" book I assume its not a fluctuation in supply. I assume its a fluctuation in release date. Since I did put an order in on the day the books were announced, this isn't too surprising. BookSurge (Amazon.com's Print-on-Demand service) has partnered with Ancestry to produce 277,577 books in a series entitled "Our Name in History". Each volume costs $29.95. Collecting the whole series would be expensive, but most people wouldn't want the whole series. They'll only want the volumes on their various surnames of interest. The Newmark Name in History is a customized book offering a unique blend of fascinating facts, statistics and commentary about the Newmark name. The book is just one of an entire series of family name books in the Our Name in History collection. Each book in the collection is printed on demand and is compiled from hundreds of millions of records from the world's largest online resource of family history, Ancestry.com. This particular book follows the Newmark family name through history and makes the perfect gift for your family members and anyone interested in the Newmark name. In the book you'll find out about where people with the Newmark last name originated. You may discover the countries and ports they left behind, the ships they sailed and more. You'll get a better idea of where people sharing the Newmark name settled and where they may reside today in the United States, Canada, England and other countries. You'll get all this information and much more in your Newmark family name book. If your last name is not Newmark, then check out our collection of nearly 300,000 family name books to find other available names in the series. The entries at Amazon.com I looked at (just a handful) seem to range between 80-98 pages. The announcement was today. I don't have a copy to review yet. Should have one by Wednesday. 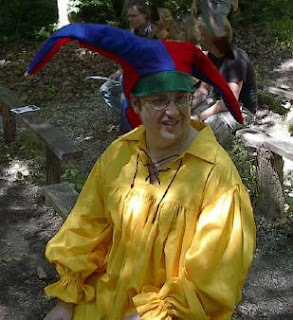 The 35th edition of the Carnival of Genealogy has been posted. The Genetic Genealogist has addressed the mysteries submitted by 19 bloggers, plus addressing some ethical concerns raised in two submissions. Even if you didn't submit your family's mystery, there's a good likelihood that his analysis of someone else's will help you. He agrees with my analsyis of my own two situations. With luck, we may be able to show that Sarah Hartley had maternal Native American ancestry. That won't help me figure out who her parents were, or help me get into Native American societies, but it would be another origin to add to my melting pot. Proving relationships with surviving "Dudelsacks" isn't a job for DNA since I believe the Y chromosome from the one other male line I know about doesn't survive today. There's always a chance I will find descendants of siblings that remained in Europe. There are several recordings my family has made over the years that I have listened to recently. They are all very different, and have caused me to think about what I personally get from these recordings, and thus what future generations might get from recordings I made. I came to the conclusion that my favorite tape was probably the most unlikely tape to be recorded. 1) My maternal grandfather, a brother, and a sister, over a weekend, recorded their memories of their childhood in Transylvania. I knew my grandfather very well. I’d often stop by his home after school. His second wife (I called her Grandma, as I never knew my mother’s mother) taught me how to play gin rummy, and it remains my favorite card game. My grandfather taught me how to bowl. He passed away in 1991, and hearing his voice brings back the memories. I saw his sister a handful of times. Enough so that I can visualize her when I hear her voice. I don’t recall ever meeting his brother. I was too young when he died. As I listened to the tape, I wrote down any information I could. My great-uncle, the eldest of the three, was about 13 when they immigrated. He remembered the most, but still, his memories were filtered through a child’s eyes, and sixty years. That he knew they arrived in Baltimore, not at Ellis Island, and that he refused to budge when my grandfather tried to insist everyone came in at Ellis Island, gives me confidence about his other memories. They talked a little about their first few years in Chicago, but nothing after that, and I wish I knew more about those years. There is a mine of information at the end of the tape as the three of them try to recall all the names of uncles, aunts, and cousins. Many who remained in Transylvania. I write everything down, but I think that it would have been better if they had written it down. There’d be no issue of me writing down names phonetically. And on the tape, when they couldn’t agree, they moved on…on paper, they could come back to it a week later. The best part of the tape is hearing their voices, and the interplay of their personalities. 2) Both my paternal grandparents were interviewed about their memories of childhood through adulthood. These tapes are heavy on information. I write it all down, though they could have written it down, too. Maybe the interviewer gets them to remember things they wouldn't otherwise have remembered. I don’t know the interviewer. My grandparents are relaxed, but their personality doesn’t come through as much as I would like. I love listening to their voices, though. I never knew this individual, and he's not a direct ancestor, so this tape means less to me, but he mentions a few things about his family life, and his career, that I write down. His comments about life in the 30s are also interesting in a historical sense. 4) On my grandmother’s 80th birthday my parents, aunts, uncles, cousins and myself crowded into a van and drove her around town, driving by old homes, old schools, etc. The entire trip was recorded. It's been twelve years since we did this. It's been five years since she passed away. The conversation was chaotic. There are people speaking simultaneously, arguments, and hilarity. Informationally, I actually think this contains the least of any tape, but I love it the most. Everyone’s personality comes through in full force. I also know that while it’s going to be difficult, I have to transcribe the tape, because someone who recognizes all the voices needs to do it. I think the next generation, even though they won’t have the pleasure of recognizing all the voices, will get pleasure out of hearing everyone having such a great time, and will certainly appreciate knowing who is saying what as they match personalities with names. It didn’t take me much thought to come up with the easiest way to reproduce the results of the fourth tape. We didn’t have to wait for a birthday or anniversary. All we really needed to do was bring a tape recorder to Thanksgiving Dinner. Or any Sunday Dinner at my grandparents when I was a kid would have been grand to hear played back. It wouldn’t matter that the conversation wasn’t about family roots – and it might almost be better if it wasn’t. All that stuff can be written down. The tape recorder (or now the video recorder) captures us as we are, for posterity. Talk about politics, talk about sports, talk about the weather. I’d love to know what my great-grandparents talked about around the dinner table. 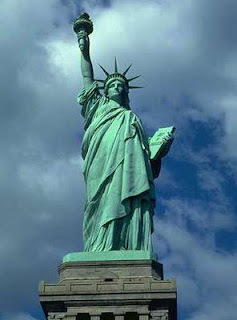 The Statue of Liberty was dedicated 121 years ago on October 28, 1886. Currently, if asked, I am Transylvanian, Dutch, Polish, Russian, Lithuanian, British, French, German, and possibly Choctaw. Except for that one small possibility, I'm 100% immigrant. I'm also 100% American. The presence of anti-Immigrant attitudes in America disturbs me. It tells me we're forgetting our history. I wonder if some people were to have a conversation with the spirits of their great-grandparents, what those ancestors would say to them. The great American melting pot. For the 35th edition of the Carnival of Genealogy, The Genetic Genealogist, who has a Ph.D. in biochemistry with a concentration in genetics, has offered to analyze whether or not certain family mysteries could be solved by DNA tests. I’d actually been giving this some thought prior to the announcement, reading various websites, wondering whether I should get a test done, or convince a relative or two to do so. A relative has already participated in the National Geographic Genographic study, which might eliminate the need for others in the family to take the same/similar test. There are basically two mysteries/questions. My non-expert conclusion is that DNA could help solve one of them, but unfortunately, not likely the other. No vital statistics are known about Sarah (birth date/location; death date/location; names of parents) so tracing her ancestry is difficult by normal means. If she were a full-blooded Native American, or if half-blooded, and her mother was full-blooded, it is my understanding that an mtDNA test of either myself, or my mother, would verify this. Of course, if the test came back negative, it would still be possible she was half-blooded, and her father was the full-blood. There are some reports of genetic tests that tell you that you are x% Native American. That suggests that it isn't telling you about your mother's mother's mother's mother's.....mother only. That it can look at your broader genetic makeup. If that is possible, then it's likely my mother should take the test, because whatever the percentage is, her percentage would be twice mine, and easier to detect. This mystery is whether or not my research regarding Selig (Dudelsack) Feinstein’s siblings is correct. I think I have found one brother (Julius Odelson) and one sister (Tillie Oberman). Unfortunately, no descendants of the sister would have the Dudelsack Y chromosome. I wouldn’t either, but there are several direct male descendents of Selig who might be willing to take the test. Possible brother, Julius, had two sons, though I believe only one had a child, and that child was a daughter. So even if she has living descendants (which isn’t clear) there’d be no way to test their relationship. So I’m left with Tillie’s death certificate, with parent names that match Selig’s, which is almost certain proof in my mind that she was Selig’s sister, and by deduction, the likelihood that Julius was probably their brother. Julius had a daughter who probably has some descendants in St. Louis, but the name of her husband was relatively common, and the list of people I’d have to blindly write letters to is extensive. I might do it, but it’s not a job for DNA. I plan on participating in National Novel Writing Month in November, which will necessitate a slight decrease in my genealogical pursuits. However, the tentative title for my planned masterpiece is Ahnentafel Falafel. I've been reading a lot about DNA testing recently. I have one relative who has participated in the Natl Geographic project, placing our family's paternal ancestry in the K2 haplogroup. I am considering getting an mtDNA test to answer a question about a maternal ancestor. I will be writing more about that later. This morning I found Patrick Swayze's alleged genealogy, and confirmed that the Swayze in my tree intersected with his tree. I haven't done the math yet1 to see what number cousin we are. I have two left feet though. The only dirty dancing I can do is with iambics, and even then, I'll frequently step on a foot. We allegedly intersect at Judge Samuel Swayze (1688-1710). Judge Samuel Swayze's parents were Joseph Swayze and Mary Betts. Whoever entered the Swayze tree doesn't carry Mary Betts' line back further than Mary's mother Joanna Chamberlain Betts, however, Joanna is (according to One World Tree) a direct descendant of Chaucer. Which would make cousin Patrick one too. Recently when commenting on the Cost of Genealogy, I said that I didn't see myself travelling to Europe to do research due to the cost of travel. Since I have programmed "Transylvania" as one of my News Topics at my customized Google News page, I learned this morning that there's a Budget airline in Europe called Wizz that has stops in London, England; Cluj, Romania; and Poland. The news article wasn't specific about cities in Poland, but Wizz Air has an English website, and they do stop in Warsaw. Anyone planning a trip in Europe might want to check out their routes - there are stops in France, Spain, Germany, Norway, Italy, and Greece as well. London, Cluj and Warsaw would be the three main stops of any Family History trip I would probably make. Whether it was to do research, or just visit the locations my ancestors lived. I could do a round-trip from London-Cluj for 53.60 GBP ($109). Of course, I have to get to London. It's probably still not any time soon, but it's nice to know about a budget airline that stops in so many European cities.